Regardless of whatever else may have happened on this week’s episode of Bates Motel, it will always be remembered as the episode where things got even ickier than before. 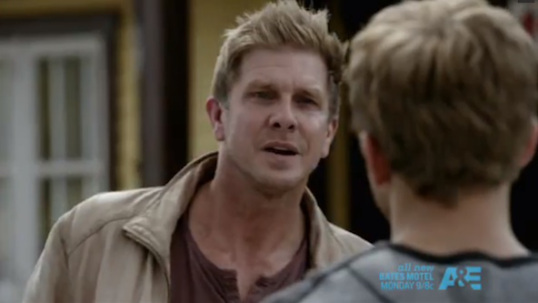 I’m talking, of course, about the revelation that Dylan’s (Max Thieriot) father also happens to be his uncle, Caleb (Kenny Johnson). I have to admit that I wasn’t necessarily surprised by this. In fact, when one thinks about the world that Bates Motel takes place in, there was really no way that Caleb wasn’t going to turn out to be Dylan’s father. It explains why Norma wants nothing to do with her oldest son and Max Thieriot, Vera Farmiga, and Kenny Johnson all deserve a lot of credit for their performances tonight. That said, I’m hoping that Caleb — much like Deputy Shelby and so many of the other sleazy men who have stopped off at the Motel — will not be around that much longer because, seriously, he is just so icky! Bates Motel has a good track record for violently executing sexual predators and I expect that same fate is waiting for Caleb. If nothing else, Bates Motel seems to be making a good case against men in general. Is there a single man in Norma Bates’s life who isn’t a deviant of some sort? Earlier in the episode — before we discovered that Caleb was Dylan’s father — Norma met a guy named George (Michael Vartan). George seems like a really nice guy but, seeing as this is Bates Motel, I’m still expecting him to have somebody chained up in his basement. Along with the arrival of Uncle Caleb and Norma meeting George, this week’s other major subplot was Emma (Olivia Cooke) attempting to throw a beachside memorial service for Bradley. As I’ve stated in the past, Emma is my favorite character so I was happy to finally see her getting to do something. The memorial service was neatly contrasted with the garden party that Norma attended. And just as Norma met George, Norman got to know Cody (Paloma Kwiatkowski), who, now that Bradley is gone, is apparently going to be the latest obstacle keeping Emma and Norman from getting together. Then again, that might be for the best. Norman and Emma are an adorable couple but, ultimately, he is Norman Bates, isn’t he? This week’s “Vera Farmiga is a great actress who deserves an Emmy moment”: The Grand Canyon joke. The great White Pine Bay drug war is apparently still raging. Fortunately, I love Max Thieriot or else the whole drug war would be kind of boring. That said, Dylan was kinda lingering a bit while Norma was getting dressed. Again — icky! The name of the town newspaper is the White Pine Bay Current. For some reason, that amused me. I felt so bad for Norma when she saw she hadn’t been cast in the town musical. Tonight’s episode was directed by Lodge Kerrigan, who has a great name. One thing that was not mentioned in this week’s episode: The murder of Ms. Watson. I really hope that the show isn’t going to abandon that mystery just because Sheriff Romero arrested the wrong guy last week. I have to admit that I’m still holding out hope that Norman did not kill Ms. Watson. It’s interesting to note that Bates Motel and The Following both air on Monday nights. They’re both unapologetically sordid shows about psychotic murderers and sexual deviants. However, I love Bates Motel and I absolutely hate what I’ve seen of The Following. The difference is that The Following is a sincerely misogynistic show whereas Bates Motel seems to actually like its cast of misfits. “You’re in the chorus? Do you want to be in the chorus?” Trust me, nobody wants to be in the chorus! That said, I would rather be in the chorus than be on the tech crew. Poor Norman.